Five a.m. is the worse time to wake a teenager. We’re unreasonable angry and act extraordinarily slow no matter how fast we think we’re moving. In fact, if it’s a good night, it’s usually when we go to bed. Unfortunately last night was not one of those nights – today we’re going on a ride nice and early. Bouncing along a rocky road in a van full of other sleepy tourists, my mom, Uncle Steve, and I drive from our hotel in Bodrem, Turkey, to a wide open plain. As the sun rises, we stand by two massive baskets, big enough to fit ten people in each one, sipping hot cocoa. Suddenly, two I-don’t-even-know-whats roar while spewing fire into two of the biggest balloons I have ever seen. As the morning sun softly caresses the smooth and pointy mountains, our hot air balloon is ready to set sail. At this point, my hectic teenage brain has not started thinking about boys, music, and errands yet, considering this is the third hour in attempt to fully wake up. This turns out to be a good thing because I enter this unique experience with a fresh mind. I am no longer your typical teen who thinks too much. Right now I am empty, I have time, and I am ready to indulge in wonder and amazement to come. 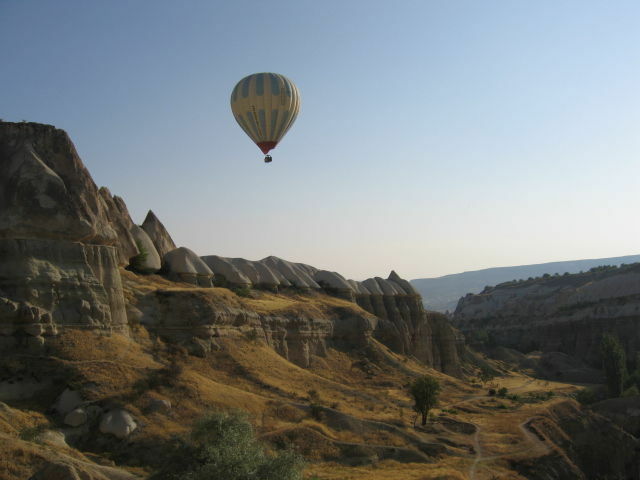 Floating higher and higher through the mountains and the great plains of Turkey’s countryside, I never thought I can be so removed – suspended in mid air – yet feel so connected to the world around me. Looking at the world from afar and above, I realize my concerns are so insignificant compared to the wondrousness of nature. From here, the earth looks vast and infinite and I feel small. However this irrelevance that I feel for myself is positive and eye opening. This physical change in perspective heavily influences the way I see the world and myself. Instead looking inward, I want to look out. I am not saying I am determined to disregard my feelings, but something tells me the world beyond myself has so to offer. I don’t want complete control over my life anymore. I have to give the things I encounter in life, whether it is internships, or relationships, a chance to mold me so I can grow. This is because I realize if I don’t let the world in, I may shut myself out from life changing experiences. Who wants to do that? After being in the air for about two hours, we descend into a grassy field. Our landing is smooth and one of the workers from our hot air balloon runs through the field, snagging a bouquet of beautiful white flowers. He gives them to me and we exchange smiles. Now, I can pull out my Ipod and wait for the bus to come pick us up, or I can talk to this sweet man. So I turn around and forget about me for a second, because I want to know more about him. Next Article Next Article Mahalo and Aloha!